The ground communication terminal for the Brazil/United States communication link via the Relay satellite which was launched late in 1962. 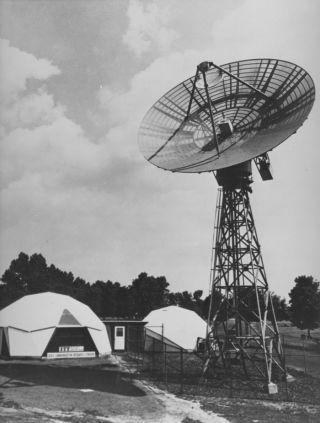 In this historical photo from the U.S. space agency, this specially designed 30-foot parabolic antenna, developed by International Telephone and Telegraph Federal Laboratories, served as a Project Relay space communication terminal, and was located in the United States. The antenna was part of the ground communication terminal of a United States to Brazil communication link via the Relay satellite launched by a NASA Delta rocket on December 13, 1962.